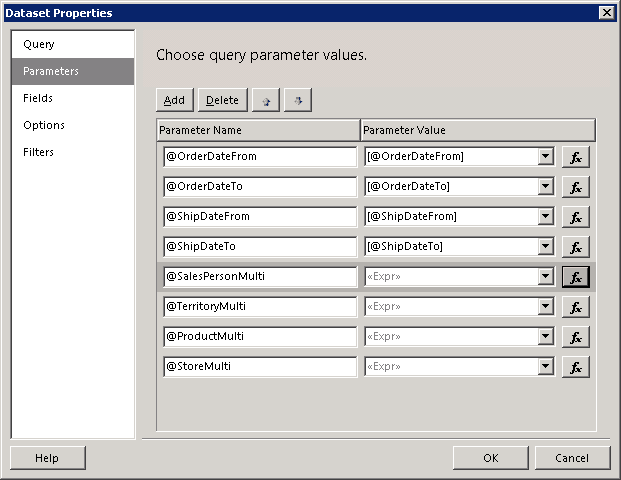 SSRS supports multi-value parameters, which is nice, but there are a few issues with them. This is how I deal with them. The reason the (Select All) option is a problem is that it is a really inelegant way of saying 'this parameter does not matter to me'. If you have a list with hundreds of values, passing all of them as a default option just seems wrong. Also, if your report shows the user which items they selected, printing the whole list when they choose (Select All) is excessive. Adding a single '--All--' value that the report interprets as meaning all the options. 1. 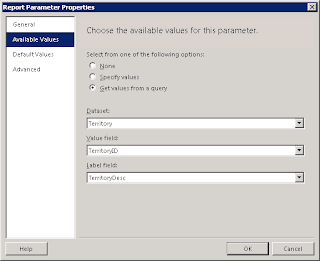 The stored procedure for the report should declare any multi-value parameters as type nvarchar(max). 2. 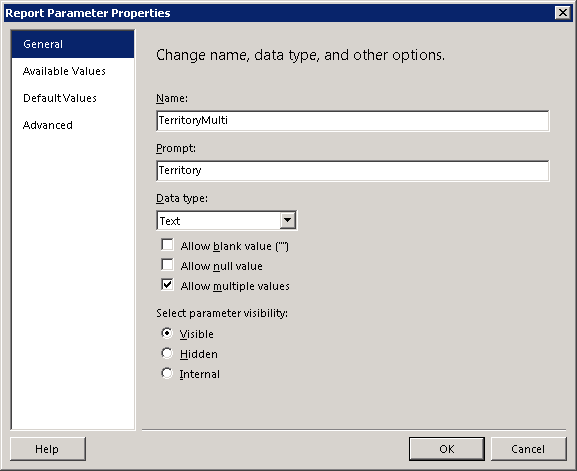 In the Report Designer, your parameter should have the 'Allow multiple values' option ticked (obviously). Also, it helps to set the Data type to 'Text' even if its actually an integer or something, because we're going to have to treat it as text later on in the Stored Procedure. This will just string the multi-values together into a comma separated string. ... that is, it uses ufnSplit to split the passed values out into a table, and then selects from that table and uses 'in' to check for membership. As mentioned above, the (Select All) option on SSRS multi-picks leads down the path of madness. We can't turn (Select All) off (at least not in the default Report Manager) but we can add our own 'magic value' that the report will then interpret as 'any value is fine'. 7. Choose your magic value that the report should interpret as 'any value is fine'. Often '-1' is a good magic value to use. ... so here we use a union to add on the magic value, and the extra SortFix column is there to make sure the magic value appears at the top. Note that here, if the user selects the magic '--All--' value and some other values, it will be interpreted as if they just selected '--All--'. There are still a few possible problems; users will need to be helped to understand the difference between (Select All) and '--All--', and why they should use the 'magic value'. And users who select other values and forget to uncheck the '--All--' option may get confusing results - one way out of that is to get the stored procedure to throw an error if it detects that '--All--' has been used in conjunction with other values. edit: Another way to make selection of multi-value parameters easier is to stop using the default 'Report Manager' ui and use something else instead. See CrissCross, an open-source UI for running SSRS reports that works well with the techniques described above. I've been using the method introduced in this post for a while and the only inconvenience is that when we want to select only some of the values from the list we need remember to clear the "--All--" first. Users sometimes forget and the report will still include all records. My new approach is to add a "--Empty--" selection (value as -1) instead of the "--All--". The "--Empty--" selection is to cover the records with NULL value in this field. 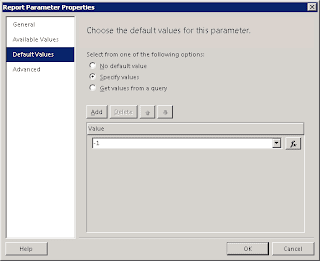 The parameter is set to select all items including the "--Empty--" by default. This complies with SSRS's original "(Select All)" convention. After lots of googling, I have found the light! re: where am i going wrong? Hmm, not sure but it might be the default settings on the Report Manager - sometimes they end up different to the defaults in the report defn. In Report Manager (the SSRS server) go to the report properties (show details, click edit, etc) then go to the Parameters tab and see what defaults are specified for each parameter. I think the problem lies in this piece of code, i only have the one description field (no ID) which i was selecting distinct for the parameter, how do I apply this? can i use same function for each multi-value parameter ?? "1. 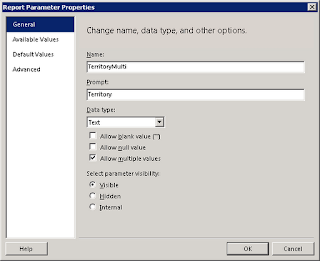 The stored procedure for the report should declare any multi-value parameters as type nvarchar(max)." Now, I feel like dancing...pa..pa..ra..pa..pa! If the user selects "---ALL---" and also ticks a few other values they can get unexpected results. This can be prevented by getting the parameter expression to determine whether the user has done this and getting the same expression to prevent all records being returned and just showing the ones the user ticked. -- -1 was used a the value associated with "---All---"
-- (0) refers to the very first parameter ticked, and relies on the "---ALL---"
PS. Thanks for the very useful post. I'm interested in your thoughts on this technique. 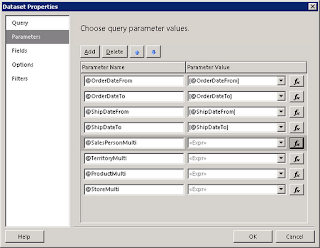 You can change the SQL of the reports main dataset to detect whether all values were ticked. -- parameter. (Except it does not include the SELECT to add the "---All---" option. -- from being called again. 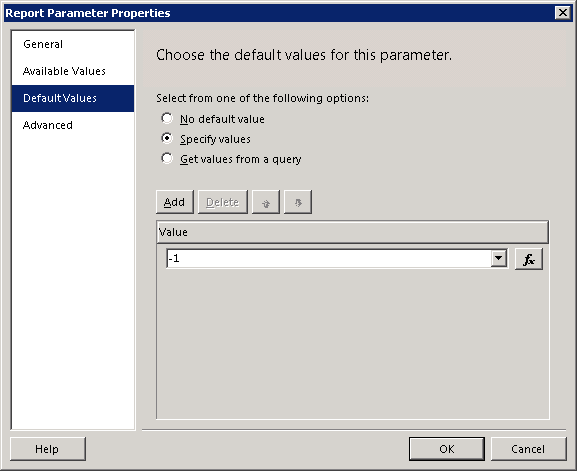 One last thought, the technique using the parameter @prmClientID_COUNTOFVALUES to determine whether all values were ticked actually means that there is no need for the "---ALL---" values option. So just to clarify, here's the code that I now use that stops the function dbo.ufnSplit being called if the user selects the standard "(Select All)". There is no need to give the user the "----ALL----" option.